Warid has offered many internet packages for its valued customers to ensure that their customers feel free to share or get world information on their palm. Warid GPRS buckets are flexible and educe economical tariffs and users feel no worry of surfing heavy websites, listening to online music, downloading mobile applications and other activities on internet. Get complete details of Warid internet packages and follow the activation procedure to enjoy Warid. Unlimited Edge is a good offer by Warid that tells the real story of company’s efforts to keep their customers happier forever. You can stay online for many hours even if you have low balance. Edge is the extended form of GPRS and it is more efficient and economical than GPRS bundles. The amazing part is that you are only charged for the usage of data. Find the details in below paragraph and enjoy the unlimited online facility of Warid. You are given 2GB free units after subscription to Unlimited Edge. Each MB internet data usage will cost you Rs.0.20 plus taxes / 20 paisa per MB. It is only subscribed to the Postpaid customers of Warid. Monthly line rent of this internet is Rs.500 plus taxes. You are also billed for a security deposit of Rs.1000 only for once after subscription. It can be bundled with any postpaid voice package. To subscribe to this bundle offer, you can call Warid helpline at 321 or you can visit the nearest Warid franchise. With globalization of world, it is very important for all of us to stay connected with each other and for this purpose; Warid has been working for several years while introducing best packages. You will find plenty of stuff in this Enterprise GPRS packages with different line rents and different data units. 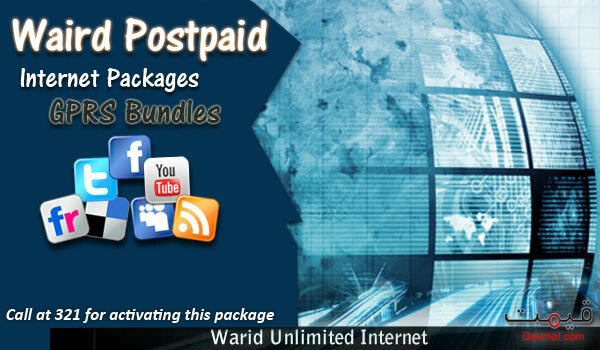 These packages are only for the postpaid customers of Warid and prepaid customers cannot subscribe to these packages. The details of each package have been mentioned in the following lines. You are given 6MB of free units after subscribing to this package. Charges are Rs.12 plus taxes per MB with an additional cost of Rs.80 as line rent. These charges will be applied only on the actual usage of data. You will also have to pay a security fee of Rs.500 plus taxes. You can get this GPRS package with any voice plan like if you have platinum voice package, you can get GPRS80 or any other package. Call at 321 for activating this package. At this package, offer of free units are 15MB. This package will cost you Rs.12 plus taxes per MB. Line rent of this package is Rs.120. You are charged as per KB basis means your actual data usage will count the deducted balance. To activate this package, you are also demanded to furnish a security deposit of Rs.500. To get this GPRS120 package, you can call at Warid helpline number 321 or visit the nearest business centers. Get 20MB of free units after subscribing to GPRS200 package. You will be charged at the rate of Rs.8 pus taxes per MB. Line rent will cost you Rs.200 plus 10% withholding tax. Same deposit of Rs. 500 is required for this package. The process of billing these charges is similar to that of postpaid bill. If you don’t want a voice package, you can activate the GPRS bundle package only. At GPRS240 package, you will enjoy 30MB free units. These unites will be charges at the rate of Rs.6 per MB. As the name suggests, line rent charges are Rs.240 plus 10% withholding tax. Security deposit fee is Rs.500. This package is also bundled at postpaid numbers only. Infinity package allows you surfing of 2GB data on the web. You will be charged at the rate of Rs.0.20 per MB / 20 paisa per MB. The security deposit for infinity package has been revised from Rs.500 to Rs.1000. Line rent charges are Rs.500 for infinity GPRS package. This GPRS package can be activated only on postpaid numbers. Postpaid internet charges are 2 much high. Please less your postpaid internet rates.